Curses are a complicated and tricky business. Not because curses themselves are complicated, but because there are a lot of misconceptions when it comes to curses. Not to mention the very mention of the word "curse" incites thoughts of evil witches, dastardly sorcerers, and light-footed demons coming to sprinkle your life with bad luck. The truth is, curses aren't the magnificent design of a web of evil through which any ensnared can no longer survive. To begin, there is no curse which is incapable of being resolved. It is the beauty of the laws of not only magick, but existence, that nothing can be out of balance. Anything that can be done can be undone. It doesn't mean there is always an easy fix, but it means a fix exists. Another common misconception is that people tend to go with the "big guns" with curses, and that's simply not true. We've all read the fairytales of evil witches exacting complex & scary curses upon unsuspecting victims, curses which keep someone sleeping for 100 years, or follow family members through generations, or keeping people in fits of bad luck and doom. The truth of the matter is that since the 20th century these complex curses simply cease to exist. Even in the past few thousand years the capability of someone being able to perform such complicated work was dwindled down to a handful of powerful people, and on top of that the number shrinks further based on the income of people who could afford to pay for such complicated work. In medieval times the average income for European citizens was between $500-$1,000 a year by today's standards. Not only is that barely enough to survive, it's certainly not enough to afford additional expenses like exacting a powerful, generational curse. And don't think for a moment that scams in the magickal community are regaled only to the 21st century. Just like today there were fakes who would take money, livestock, and other items in trade and not provide any service at all, but talk a great game for show. The truth of the matter is this, we're living in times of immediate gratification & no one has the kind of patience it takes to commit to the arduous task of exacting any curse beyond something that gives them immediate satisfaction. We're no longer in the world where people would work on something for a year and at the end of that year's time be proud of their long-term commitment. We are in the world of "give it to me now! ", and the ebb & flow of magick has been caught in that tide. Most people will curse the person they are upset with, and usually it doesn't even go beyond an immediate curse. Which, dissolves on its own and its impact is slight (if at all). There is no free ride. If you curse someone, you will pay. It really is that simple, and there's no way out of it. For those who exact generational curses there is no one-sided curse, balance must be maintained for the curse to be effective, which essentially means not only are they cursing the generations of the target bloodline, they are cursing their own bloodline who has to pay to keep the curse going. When it comes to curses you have to ask why? Why would you want to curse someone, or why would they want to curse you? No one is going to go through the expense, pain, and long-term commitment of generation-cursing your family if you cut them off in traffic, stole their boyfriend, or you were promoted over them. If you have stolen someone's boyfriend they are more likely to go with a simple love curse which will make you unlucky in that relationship. They are not even likely to go as far as cursing you in love forever, because their end-goal is to get their boyfriend back, after that they could care less about you & what happens to you. If you have been promoted over someone who believes they deserved the job before you then they are likely to go with curses which make you unsuccessful in your work and to get you either demoted or fired. In almost all cases the curses are quick, to the point, and want immediate reaction. In the 21st century no one wants a slow-acting curse where they may have to wait & wait to see results; which is the case of bloodline & generational curses. A common misconception with bloodline & generational curses is that every member of that bloodline, or every descendant will be affected by the curse, that couldn't be farther from the truth. A bloodline or generational curse is usually only effective with the immediate family of the original cursed person (and even then not all family members are effected), and with every new generation the curse is diluted into non-existence. 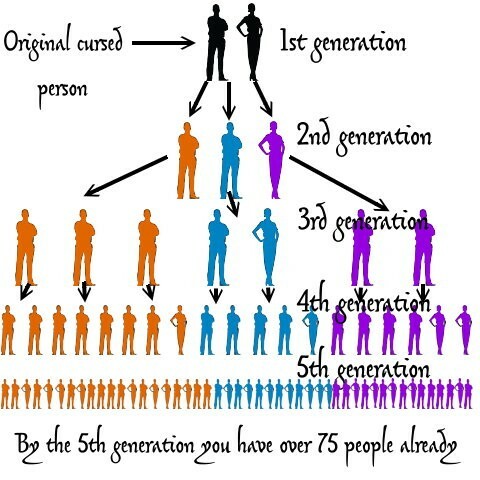 To put it into a logical visual the picture below shows you how in just 5 generations with an average of 2-3 children per descendant, you are already over 75 people by the 5th generation! Think, for just a moment, about the magnificent power the curse must possess in order to be effective for generations. A generational curse would have to be exponentially powerful, which is a feat of great, magickal prowess all by itself, let alone it being applied in the terms of a curse. Not to mention even in the case where someone attempts to exact a generational curse, the curse's power has to survive the person who cast it, because once they die the debt has to be continued to be paid and that payment is inherited by the curser's bloodline. If they don't continue to feed the power of the curse the curse will dissolve on its own. You have to bear in mind that not every descendant is the slave of this curse. A curse can be a terrible thing, but it's not all-powerful. Each person, when born, is a blank slate ready for Destiny, Fate, and the experiences life affords to take on their own shape. They don't each come into the world with the curse over their head. Each descendant's path may not even lend itself to the possibility of recognizing a curse. As with every human being, each being different, each case is on its own merit. Therefore, a curse can sputter & die quickly in some family bloodlines and linger in others. In all cases, there are a myriad of circumstances that can happen to make a curse less effective, or more effective. You might be thinking "well, can't I just put a generational curse on someone and piggyback the source of energy to something else like Universal energy?"... no, because the Universe isn't going to pay your debts for you. The Universe has no vendetta against your target and it's not going to suffer your petty desire to curse someone. If someone promises you they can exact a curse with a Universal backing they might as well be selling you Jack's beanstalk beans or cheese from the Moon, because that's the kind of fairytale they're selling you. Blood: This can mean one of two things; the usage of blood to enact a curse, or someone in your bloodline who curses you. General: A curse that is simply a general curse and can manifest in random ways throughout someone's life. Generational: This curse is exacted upon a bloodline and the family as a whole becomes a target. This differs from a multi-curse because it's intended to haunt the generations of that family. Immediate: These are curses which almost everyone has exacted on someone else. They are the words spoken in the heat of anger to curse someone with some form of downfall. Most forms of psychic attacks fall under this classification as well because most psychic curses are send from person-to-person in the heat of the moment. Mono: These curses have one target, and the one target bears the brunt of the curse. Multi: These curses have multiple targets, and depending on the accuracy and experience of the person performing the curse the curse can either be equal in exaction amongst the targets, or the curse may be lop-sided in effect on one person more than others; that lop-sided effect can vary day-to-day. Non-Blood: This indicates someone who is not of your bloodline has cursed you; whether it's someone you know or not. Pro-Clause: This means there is a curse loophole where the curse can be reversed if certain criteria is met. Psychic: For the type of psychic attack that is not an immediate-curse that happens spontaneously, a psychic curse can be an ongoing pressure applied to someone through means of psychic natures such as telepathy. Sans-Clause: This means there is no curse escape provided by the curse and it will have to be rectified another way. Self-Cast: These are curses performed by you and you bear the full weight of the cost of casting the curse. Targeted: The curse has a specific motive and will work to obtain that goal. Third-Party: These are curses you pay to be performed and depending on the curse the practitioner may carry some of the cost of casting in addition to your cost to bear. How do you know when you've been cursed? That's a great question. You have to be reasonable with yourself and not be caught up in the frenzy of either hearing someone else talk about being cursed, or being told by someone that you've been cursed. You need to be calm and rational in curse-diagnosis. You're not cursed if something bad happens to you as the result of something bad you've done. If you have stolen something and then you get arrested, that is not a curse. If you have cheated on your spouse and you are caught or the person you're cheating with does something bad to you, that's not a curse. If you have scammed someone and they find out and everyone hates you, that is not a curse. You have to recognize personal responsibility and be willing to take your knocks if you have done something bad. Simply put, if you do bad things, bad things are going to happen to you... no curse needed. All of that said, there are people who have bad things happen because of curses. A general curse can be harder to diagnose because it can happen randomly, any time, and manifest in any way possible. 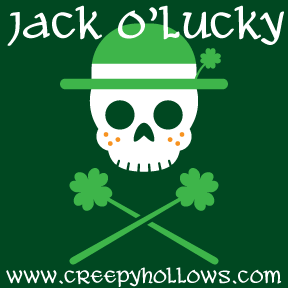 There may be times, with general curses, where you have good luck and then bad luck. A targeted curse will act on something specific. For example, you've been targeted because someone wants you to break up with your boyfriend, or they want you to lose your job. You will see the curse manifest in that specific way, and that way only. If someone curses you to lose your job, you might lose your job, but then win the lottery, find the love of your life, or any other lucky circumstance. If you think you've been cursed then you should take action immediately with common remedies because most of the time that will cure your problem. If it persists then you need to keep a short journal of your bouts with bad luck and see if there is a pattern to determine if it is a general curse or targeted curse. We recommend keeping a journal for at least 30 days because sometimes events that seem random may have links between them that would be difficult to see if not documented. If you really think you have a problematic curse that cannot be remedied by normal means then please excise extreme caution in finding a skilled practitioner to help you. If someone gives you a bad diagnosis that you are generation-cursed or bloodline cursed, then you will need to immediately receive two more opinions from two other skilled practitioners. Do not tell the other two practitioners what the first one said to you, simply tell them you think you're having trouble in your life and see what they have to say. Do not give away too much information from the start. In the 21st century most curses are easily remedied by already tried-and-true cures through casting a curse removal spell yourself, or buying curse removal amulets, or tasking protective spirits to remove the effects of the curse. Of course, we recommend you being proactive and launching a preemptive, curse protection endeavor so you never have to worry about it. Just as there a million ways to curse someone, there are a million ways for them to get out of it. If someone is into magick & the Arts they are likely to discover what you've done and either attempt to reverse the curse back to you (which means you'll pay twice for cursing them; once for the original curse, and then the curse coming back on you), they will curse you on their own, they will disarm your curse, or your curse never even makes it because they are well-protected. It's usually impotent in cursing someone who is in magick & the Arts because they'll discover what you've done and they'll remedy the situation. For this reason any expensive curse you are thinking about is really pointless. If someone is not in the Arts there is a great deal more involved in what happens. There is an age-old debate on whether or not which revolves around the thought that if someone doesn't believe, it can't hurt them. That's not really true, and here's why... a curse is a curse, if it's enacted upon someone they are going to have a side effect of that curse whether they believe or not. They will likely believe they've come into a bout of bad luck and go about their lives. Some will have enough of an impact they'll seek resolution either through their religion, or they will seek out magick as a temporary solution and not really engage in magick themselves, or they'll just live with it until it no longer is a problem. Either way, once a curse is released it's going to hit the mark. There are many, many ways to remove a curse. So many it would be impossible to review them all. Because you can remove a curse, dissolve a curse, protect against a curse, return a curse, convert a curse... this is just for openers. You can remove a curse completely without any trace it was there... you can return the curse right back to the person so they endure the pain they intended to inflict on you... or you can convert a curse so the intent goes from bad to good! The possibilities for dealing with curses really are endless. As said above, in the 21st century people are not going for the long, drawn-out curses where it costs great sums of money and lots of time to exact a curse; most people are going for the immediate reward. The art of casting generational or bloodline curses is rapidly becoming a lost Art that most new & upcoming practitioners don't even have the ritual recipe for. These days the curses sold to the public talk a great game & promise a lot, but they really fall into a one-size-fits-all as they aren't the truly complex and frightening feat they once were. Why? For starters, a lot of the original ingredients aren't even available to the public anymore & some aren't even available in most countries. Add to that the fact that most practitioners don't have any experience in dealing with such a powerful ritual and they certainly aren't going to do it for $9.99, $19.99, or even $199.99. For a real, generational or bloodline curse that is really effective and not just a quick job that you'll see effects in the first generation but then fizzles out by the second and you won't even know because you're either too old or dead to realize you've been scammed, you're going to pay more money than most people earn in a year... of course, that is if you can find someone still alive who not only possesses the knowledge & ability, but they're willing to do it for you. If someone tells you that you have an irreversible bloodline or generational curse you need to raise your eyebrow and pull out your BS meter. The "you're cursed & I can remove it for money" is one of the oldest scams in the magickal community, and certainly is a blight amongst all of us. The odds you're the one in a million who actually had an ancestor who was either so terrible they cursed your entire bloodline is actually more than a one in a million shot. If you use our example of a typical bloodline chart where descendants have between 2-3 offspring by the time you get to a 10th generation you're already over 6,000 people in your bloodline... that makes the odds you have someone in your bloodline so terrible it can carry the weight of thousands of people really microscopic. You have many choices in the 21st century. Information & remedies are more readily available to those alive today than any other time in history, and probably more than all thousands of previous years combined. The 21st century is the age of knowledge, without a doubt, because anything you could ever want, desire, or need is ready for you on the internet. If you have any form of curse you can utilize spells you cast yourself, spellcast amulets you buy from practitioners, spirit bindings or entity bindings, or even use natural resources as those in the olde days. Cursing is a tricky business because there isn't a blanket reaction that will happen to everyone. First of all, if you're going to curse someone who is in the Arts you have a good chance it won't even make it to the person. If they're already protected against curses you're curse will just bounce off without any impact. Second of all, every person is unique, some people are blessed and they are less likely to have anything bad happen to them, therefore your curse is nothing more than a little blip on their radar. Some people have a naturally negative energy around them and a curse may impact them far more than someone else. Aside from each, individual person's propensity towards being susceptible to curses, you have to have someone who knows what they're doing to even cast a curse. If you are casting it and you have little-to-no experience, your curse is going to fall as flat as unleavened bread. If you hire a professional it is more likely to be effective because they know what they're doing and they can provide the necessary energy to make the curse something of consequence. There is no curse which will be the same for everyone. There are two types of people when it comes to how to handle curses; those who control curses and those who prevent them. Of course those who are not in the Arts are always going to fall into the "Control" category because they are likely to not even be aware of a curse. Those who simply want to control curses will deal with them as they come. They either aren't overly worried about it, or they simply don't care. These are people who, once cursed, will cast against the curse, buy a spelled amulet to help them, or engage their spirits. They control the effect of a curse once it's already been sent. Those who are proactive will prevent any curse from even reaching themselves or their doorstep. They already have everything in place to make sure a curse is impotent against them and bears no effect no matter who cast it. This is, obviously, our recommendation for everyone. You can already have spellcasted amulets and spirits in place to deal with curses so they don't even bother you and no matter what happens you won't be effected. Wow, this was an awesome read! Thank you for all this information! This was a very thorough explanation, thank you Magnolia for posting it! The Tibetan Bonpo use and can teach what translates as "The Ransons" which is a very skillful system of manipulating karmas. Some (not complete knowledge as for that you have to go thru an initiation) knowledge can be gleaned from The 9 Ways of Bon edited/translated by David Snellgrove. There are a few Bon Lamas/Teachers in the USA. I was initiated into this, back in 1993. Last edited by Ashino Tsume roshi on Wed Oct 22, 2014 7:52 pm, edited 1 time in total. Wow..! Saved this in my files! Awesome information! Great information. Thanks for taking the time to put it all together. cnz wrote: Wow, this was an awesome read! Thank you for all this information! This is bookmark worthy. Thanks Magnolia. Your information comes, as always, just in time for me. What is the karmic backlash to the practitioner who acts as that third-party and casts a curse for someone else. While I suspect that the main backlash will fall on the person who initiated the process and requested the curse, I can't see how a person who acts as an accomplice can entirely escape notice by the universe. When you act to take someone else's free will away, your own free will is going to take some dents and dings in the process.